Answer: I hope your weekend travels are for pleasure not business. Check out . The line of bags is feminine, with enough flair that you won’t puke at your own girlieness. There is which has a cross body strap for when you overpack and don’t want to break your back. The smaller wouldn’t get you through a weekend unless you’re bringing a change of underwear and plan on staying in bed all weekend. (Again, I hope your trips are leisure, not work.) 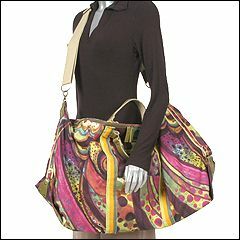 But the tote is good for taking on a plane or as your Bag #2.